A tragic death. A broken bond. A fallen warrior. In a battle against an evil tyrant, Histrun loses his beloved bond-mate. Guilt drives him to the abyss of rage and despair. Lost and alone, he journeys to the Sanctuary in search of atonement. But can he ever forgive himself? This story is set eighteen years before the events in Ancient Enemies and can be read either before or after it. Redemption is a bonus novel in an action-packed, epic fantasy series. 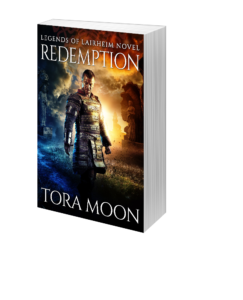 If you like ferocious shapeshifters, masterful story arcs, and intriguing magic systems, then you’ll love Tora Moon’s Legends of Lairheim series.